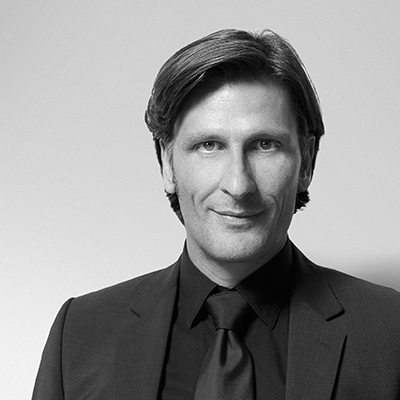 In his func­tion as Chief Cre­ation Offi­cer on the agency’s side, Peter Mar­tin is the mas­ter­mind behind the Lufthansa redesign. His agency for strate­gic brand con­sult­ing and design Mar­tin et Kar­czin­s­ki is the company’s the cor­po­rate lead agency, and has been for the past five years. True to his own pas­sion for com­mu­ni­ca­tion and design, Peter Mar­tin stud­ied com­mu­ni­ca­tions design. For Mar­tin et Kar­czin­s­ki, Peter Mar­tin is respon­si­ble for cre­ation, strate­gic brand con­sult­ing and advi­so­ry ser­vices on a C-lev­el. Mar­tin et Kar­czin­s­ki is an agency for strate­gic brand con­sult­ing and design. We view cor­po­rate iden­ti­ty as a cen­tral steer­ing tool for cor­po­rate man­age­ment, and have for the past 18 years con­tributed to our clients’ suc­cess. Mar­tin et Kar­czin­s­ki has been Lufthansa’s strate­gic con­sult­ing and cor­po­rate lead agency for five years, but has also been pro­vid­ing this sup­port to clients such as Deutsche Börse Group, Fre­se­nius Med­ical Care, Gagge­nau, Kuka, Lufthansa Group, Miles & More, Nürn­berg­er Ver­sicherung, Occhio, Sono­va and Swiss Inter­na­tion­al Air Lines.